Sorbet shades were all the rage this summer, so as usual I’m one step behind and sporting the look in autumn, thanks to China Glaze’s Light As Air. You may remember my dubiousness at the whole ‘pre-school’ pastel polish thing circa my Essie Turquoise & Caicos review and I stand by this to a certain extent (the day you see me wearing baby pink is the day you know I’ve bought nail varnishes in every single other colour). However, lilac was always my favourite pastel shade and Light As Air is a great interpretation of the colour. If it’s pink-based, or even too blue-based, pastel purple could easily verge on the sickly-sweet, more reminiscent of a Care Bear than a shade you’d happily sport on your nails. But here lies Light As Air’s trump card – it’s actually tinged more with grey, making it surprisingly subtle and actually (incredibly!) sophisticated. Having said that, it’s still pretty delectable for those with a sweet tooth as it’s almost exactly the same colour as Swizzels’ Parma Violet sweets, which I remember scoffing at parties as a child. Light As Air marked my first foray into China Glaze nail polishes and the results were mixed. Both the bottle and brush are more from the OPI school of chunkiness – the brush is slightly thinner than OPI’s but nowhere near the Essies and Zoyas of the world (which, as you already know by now, I find much easier to use). The colour was even, soft and creamy but I found the consistency a little gloopy and the finish downright terrible. Although the pigmentation was strong enough to mean only one coat alone achieved a gorgeous colour, I had huge problems getting a smooth finish and ended up doing three on some nails! Even then, as you can see, the results were still a bit bumpy and it was nowhere near self-levelling enough, with the layers clearly visible in some places. Like the brush situation, durability was also pitched somewhere between chip-happy OPI and iron-clad Essie and Zoya but it was peeling rather than chipping which proved to be Light As Air’s undoing. It’s a feather-light colour that, although more tea party than rock concert, is a categorically classy choice. It doesn’t sit well with brights but looks fabulous played against other purple tones, hence why it looked really cute mix and matched with OPI’s Pamplona Purple. Light As Air is more a Betty Draper than a Joan Holloway and would look great worn an air of elegance, a chignon, kid gloves and a 50s style floral dress. But if you don’t have any of those ingredients, don’t worry. It’s just as great at bringing out your inner lady, no chignon required! 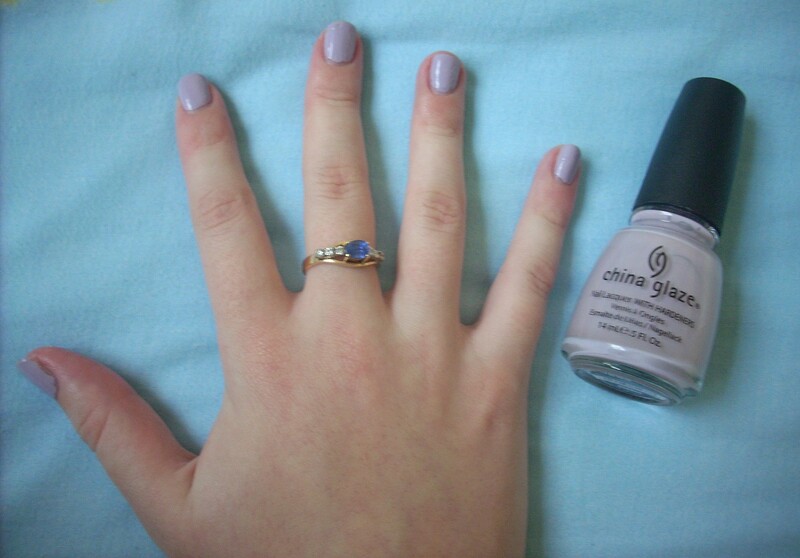 This entry was posted in Beauty and tagged Beauty, China Glaze, cosmetics, lavender, Light As Air, lilac, make-up, nail lacquer, nail polish, nail varnish, OPI, Pamplona Purple, pastel, purple, purple nail polish, review, swatch, Up & Away Collection. Bookmark the permalink.